The name Dandelion derives from a French word which means “Lion’s Tooth”. Some people consider the dandelions as the carrier of wishes. People blow the florets covering the seed head of the dandelions and make a wish in front of the flying dandelions. It is believed that these florets will bring prosperity to the blower. A superstitious concept is out there, many people believe that dandelion seeds carry their thoughts and messages to the loved ones who live in a distant place. Another use of dandelions is to gift them to the beloved person as a token of love and faithfulness. Enough about the dandelions, now let’s talk about some dandelion nail art. These yellow or orange flowers look stunning when they are seen in a cluster. They turn into white ‘puffballs’ after spending a colorful youth. Dandelions don’t need to be planted because the numerous florets of those seed heads are dispersed into the air in a stiff breeze. Everybody waits for the dandelions to turn into seeds so that they can make a wish before the seeds and blow them in the air. Dandelion seeds are mostly used in dandelions nail art. Dandelions are known better for their seeds rather than the flowers. So, you can draw the image of these seeds on your nails. French nails themselves are beautiful enough. They look simply gorgeous in dandelion nail art. This is an accent nail art of french nails painting only ring fingernail of each hand with dandelion nail art. The petals of Dandelions are blown into the air to carry messages to our beloved ones. Who knows? These petals may convey your love to the person you love. Have this dandelion nail art if you have confusion about him whether he loves you or not. This is an absolutely beautiful design. Both the dandelion flowers and “puffballs” have been painted on this nail art. 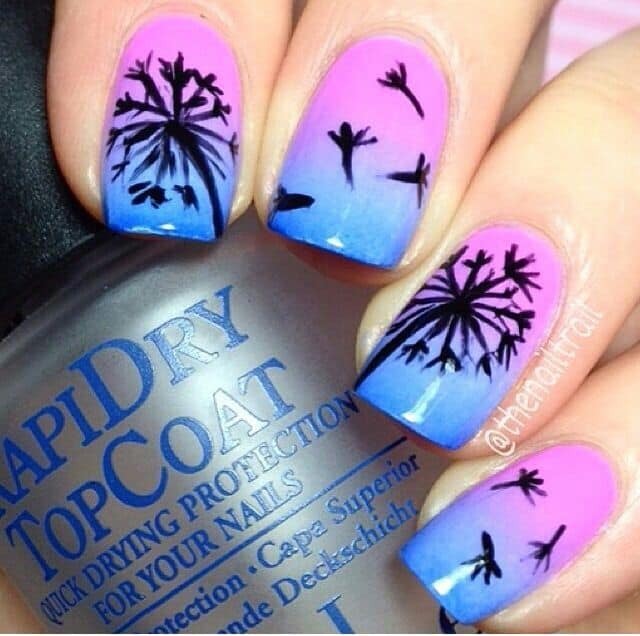 The blue base adds extra beauty to these dandelion nail art. The famous theme of blowing the seeds of dandelions is illustrated on this design. You can paint a human face on the first nail and the flying seeds can be drawn chronologically to make the design realistic. This design shows that how dandelion seeds are blown away and find a place to grow again. People get fun while flying them and they find a home to stay. This design looks amazing in black and white color. Dandelion seeds and leaves are drawn in black colors on the white nails. You can have the charm of black and white drawn on your nails while having dandelion nail art. Blow the ‘puffballs” and enjoy the show. If there is enough breeze you’ll see a heavenly scene in front of you. Dandelion seeds fade in the horizon after flying a long distance. They get lost beyond the horizon. You can have this dandelion nail art. If you don’t love complexity, this is the perfect design for you. Draw the simplified version of dandelion flowers or seeds on your grey nails. Use blue and black to create this dandelion nail art. This is the perfect dandelion nail art for the shine lovers. You can use glossy and glittery blue nail polish to paint all the nails. Then use black color to draw patterns like dandelion seeds. Spread your love into the air. If you believe in the superstition regarding conveying love to the desired person through dandelions, you can have this design. 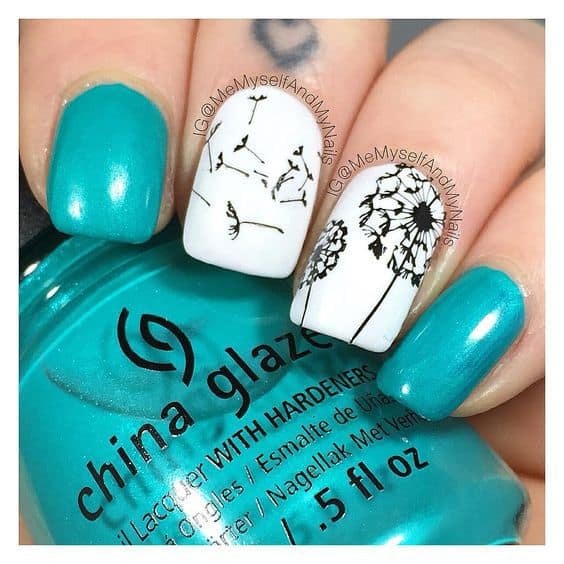 This dandelion nail art is showing that you are whispering your love to the air. Adding just a bit of red color increase the beauty of a dandelion nail art to a great extent. At first, draw dandelion stems carrying seed on the head of your white nails. Then paint the seed heads with red color. The white florets of dandelion seeds can be a good component of dandelion nail art. The sky blue background creates a sense of sky in this design. The overall design looks as if the florets were flying in the wide open sky. If you love colorful nails but want to have dandelion in the design, this is for you. You can use blue, purple and white for this design. This dandelion nail art will look awesome on your nails. Dandelion flowers wake up in the morning and go back to sleep in the evening. They open in the dawn and close in the dusk. And the seeds get dispersed gradually after opening with the daylight. You also can paint a smaller dandelion on the first nail then the size will be bigger on the next nails. Dandelions are beautiful flowers having an issue with their root system. Their roots are so well-spread that it hampers the growth of other flowers. That’s why they are not welcomed in the gardens. But, you can welcome them on your nails. Dandelion nail art is both beautiful and significant. You can read this article out to have ideas about dandelion nail art.